These delicious homemade marshmallows are full of flavor, something you won't find in a store bought marshmallow! In a small bowl, combine the water and gelatin and let it bloom, set aside until later. Prepare your pan now because you won't have time to do it later. Line an 8x8 baking dish with parchment paper. In a small saucepan, heat the maple syrup over a medium/low heat. Use a candy thermometer and continually stir the syrup until it reaches 240 degrees. As soon as it reaches this temp, remove it from the stove and pour it into a large bowl. Add in all of the other ingredients including the gelatin mixture. Use the electric mixers to whip the ingredients together. You will need to continue to whip the mixture until semi-stiff peaks begin to form (about 10 minutes). Pour the mixture into your 8x8 baking dish and even it out as well as you can. Place the pan in the fridge and let it set for at least 30 minutes. 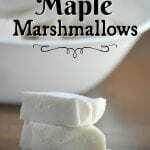 After your marshmallows have had time to set up, take them out of the fridge and sprinkle some arrowroot powder on the top. Pop the parchment paper out of the pan and then use a sharp knife to cut into marshmallow-sized pieces. Place the pieces in a bowl or bag, and sprinkle with more arrowroot powder so they won't stick together.